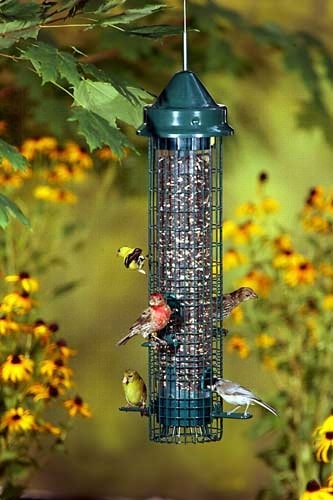 Cage Bird Feeders are Squirrel proof feeders that allow birds to feed and keep squirrels out of your bird seed! 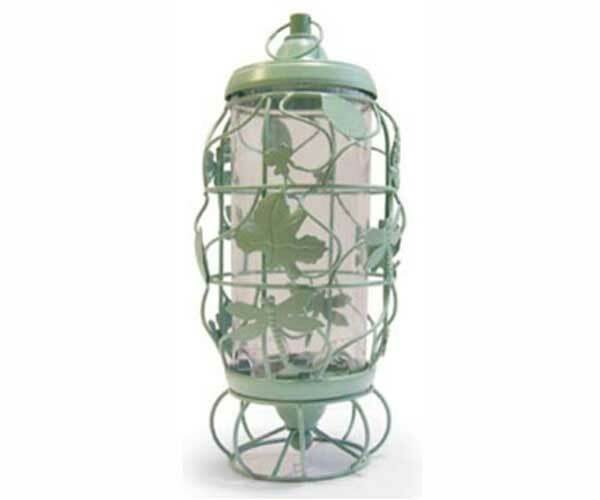 Our decorative cage birdfeeders feature a copper garden flower and leaf design creating squirrel proof feeders for natural theme beauty anywhere you place it! Holds 1 lb. of seed. Our decorative cage birdfeeders feature a copper flower and vine design that creates squirrel proof feeders with natural looking beauty! With a large, 4lb seed capacity and 8 feeding ports, there will be lots of avian feeding activity to watch without the need for frequent refills! Holds 4 lbs of seed. This high quality bird feeder is guaranteed 100% squirrel proof, providing both perching and clinging environments for hungry birds. The feeder also disassembles easily for cleaning and features seed tube ventilation to keep seed fresher! Dimensions: 21.5" Tall x 6" Dia. The Squirrel Buster Finch is designed especially for Nyjer seed, the seed of choice for finches. This feeder is guaranteed squirrel proof, has 4 clinging ports and 4 perching ports, and features the patented seed ventilation system that keeps seed fresher. The Finch Feeder dismantles easily for cleaning and all components are 100% recyclable. The proven seed saving technology makes the Squirrel Buster Finch the answer to your squirrel problems. Keep squirrels and some nuisance birds out of your birdseed by using the adjustable weight mechanism that closes access to the seed on this cage bird seed feeder! 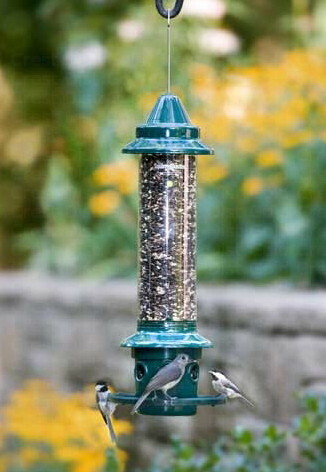 The feeder also features seed tube ventilation to keep seed fresher, adjustable perches and attachable cardinal ring. Disassembles for cleaning, is dishwasher safe and rustproof, with a 3 quart seed capacity and lifetime warranty. This attractive 2 quart feeder is 100% Squirrel Proof! It features an oak leaf design outer steel cage that protects a lightweight inner Polycarbonate plastic tube feeder, and drops down over all 6 feeding ports at once when squirrels climb on. The locking top opens with the push of a button, while the weight-activated design locks out thieving squirrels, saving seed and letting birds eat in peace! Bottom attachment removes to double as a funnel spout for easy refills. Chew proof, UV stabilized components and polycarbonate inner seed tube with powder-coated steel outer cage. Dimensions: 5.5" Diameter x 24" Tall (with hanging loop), weighs 3lbs. This decorative orange-shaped, filigree cage feeder is a perfect example of squirrel proof feeders, allowing birds in and while keeping squirrels out! This enchantingly functional birdfeeder is perfect for backyards with squirrels! 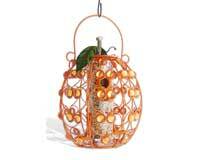 Orange in color accented by leaves on the lid and translucent orange beads throughout the body. 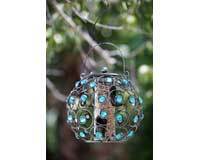 Our decorative globe-shaped, filigree cage birdfeeders allow birds in and keep squirrels out! Squirrel proof feeders are the perfect birdfeeder for backyards with squirrels! This decorative cage birdfeeder is another lovely example of our squirrel proof feeders! 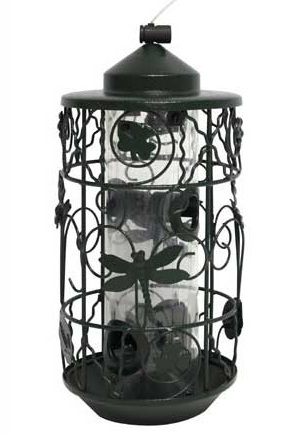 For the dragonfly lover, this birdfeeder is a perfect gift to be enjoyed year round! Metal construction with ABS tube. 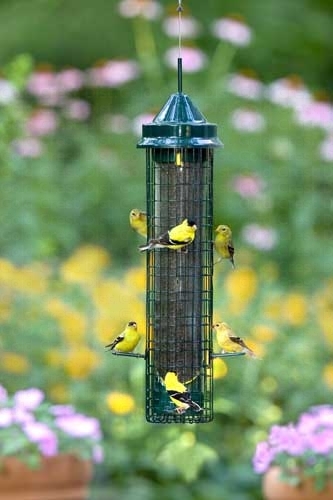 No individual perches needed as the birds land on the cage itself to feed. Protecting the seed from squirrels and other nuisance animals is a compression cinch top. It securely holds the top in place. 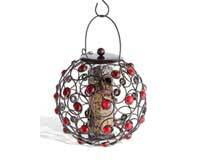 This decorative cage birdfeeder allows birds to feed while keeping squirrels out of your birdseed. 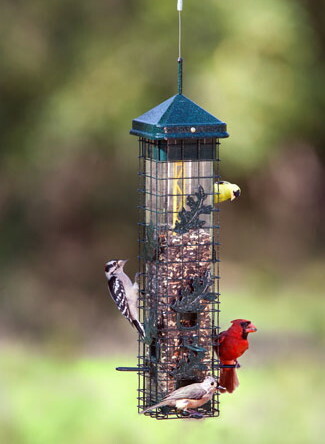 Squirrel proof feeders are the perfect style of birdfeeder for backyards with squirrels!